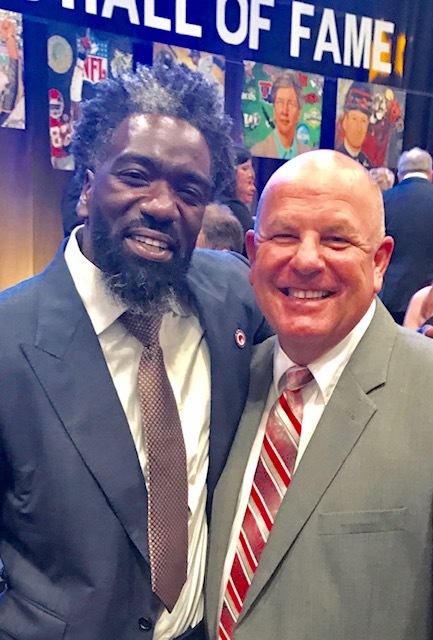 Ohatchee football coach Scott Martin (R) coached Pro Football Hall of Famer inductee Ed Reed for two seasons at Destrehan (La.) High School. Martin has stayed in contact with Reed through the years and will be in the crowd when the former NFL safety gets enshrined in Canton in August. OHATCHEE – No sooner had the announcement been made that Ed Reed was going into the Pro Football Hall of Fame than Scott Martin was on the phone making reservations in Canton. It didn’t take long; he had the number on speed dial. The Ohatchee football coach had been anticipating the day for some time. Reed was formally elected into the Pro Football Hall of Fame Saturday, a first ballot selection from a position that’s supposed to be really hard to get into the Hall. It came as no surprise to Martin, who had been keeping his fingers crossed from the moment his former player’s name first appeared on the ballot. Yes, former player. Martin was Reed’s high school coach for two seasons back in Louisiana more than 20 years ago. “I’ve coached so many great kids in my career, this one is just the best football player I ever coached,” Martin said. “We obviously knew he was going to be a really good player, but he was outstanding in every sport that he played. He was just a great athlete. Reed made his name as one of the hardest-hitting safeties in the NFL, most notably with the Baltimore Ravens, the first pure safety since Ken Houston in 1986 to go into the Hall in his first year of eligibility. Reports are it took less than 2½ hours for the committee to discuss his candidacy. As much as he deflects credit for it, Martin had perhaps the most influence in making it happen. But truth be told Martin almost lost the best player he says he’s ever coached before he really had him. It was the spring of Reed’s sophomore year at Destrehan High School and Martin had just gotten the head coaching job a few months earlier. The team was getting ready to play a spring game and Martin told his new charges at the end of the school day to report back at 4 o’clock to start preparing for the trip. The appointed hour arrived, an assistant coach calls the roll and there’s no Reed, then elevated to starting quarterback by an injury to the regular starter, and lead running back in sight. The two players arrive at the fieldhouse about 4:10 all kinds of apologetic about being late because they got on the wrong side of a train crossing through town. Martin knew exactly where they were coming from, having seen and been stopped by that train before himself. He told the players they would talk about it Monday because they weren’t going to the game, even though it meant the Fighting Wildcats would be without two of their top weapons and down to their third-string quarterback. The message was actions have consequences, regardless of one’s status on the depth chart. “Ed would tell you that was the right thing to do now,” Martin said. And it was perhaps as big a factor in Destrehan winning the district title the next year as anything that took place on the field, including a trip to a wing-T camp in West Georgia that summer that Reed did make the bus for. That didn’t make it any easier to take at the time. Of course he returned, and became an all-state athlete in multiple sports. And then went to Miami, where he graduated in three years and returned to play a fourth because he wanted to win a national championship – and did. And then played 12 years in the NFL, where he was All-Pro five times and the 2004 NFL Defensive Player of the Year. Reed was a “big-play machine” even before he got to Miami and the NFL. There were interceptions for touchdowns, punt and kick returns for touchdowns. When he wasn’t returning kicks, he was blocking them. “He was such a dominant player we just tried not to screw it up on offense because we knew he could make a play on defense,” Martin said. The play they still talk about was the one that brought Destrehan its first district title the fall after Martin excused Reed rom the spring game. The Fighting Wildcats had to win their last game of the season to pull into a three-way tie for first place. If they won by less than nine they’d be the third-place team, nine or more would put them first. Destrehan was leading 14-7 and short of a last-second Hail Mary was going to get its win for a share. On the final play of the game, the opposition threw a long pass and a player named Aaron Smith, not a Hall of Famer, intercepted. Smith brought the ball back with the clock winding down while the coaching staff was imploring him to just get down to kill the clock. Reed was trailing the play. Smith lateraled back and the future Hall of Famer weaved his way through the entire offense to score with no time left that gave his team first place. “It was an amazing sight,” Martin said. Perhaps Reed will tell that story during his induction speech in August with Martin sitting like a proud papa somewhere in the audience. Reed’s enshrinement couldn’t have worked out better for Martin. The Indians open training camp Aug. 5. The Hall of Fame ceremonies are Aug. 1-4.